2019 is a very special year for us here in Ballybrit. For a century and a half, people from the greater Galway area, across Ireland and around the world have been coming here in their tens of thousands to enjoy “the sport of kings, in the city of the tribes, at the Festival of the year”. It’s only right, at this point, that we tip our hat to Lord St Lawrence, who organised the very first race meeting here back in 1869 and to all those owners, trainers, jockeys, spectators and local businesses that have since contributed to the remarkable popularity and success of our Festival. We can just imagine the spectacle, the colour and the excitement of 40,000 people descending on Ballybrit for two days in August 1869. There were four events each day, the feature race being the inaugural Galway Plate. A handsome 100 sovereign prize tempted entrants to tackle its challenging 2½ miles and to face its eight fences, two of which were stone walls. Clearly, not a contest for the faint-hearted. it’s enough to make your hair stand on end! When you have decided on your horse, bets can be placed at any Tote outlet, with the bookies in the bookies ring or in the onsite Ladbrokes SP Office. We have a fantastic line up of live bands and DJ’s for this Summers Festival all of which is provided throughout the race day. The management reserve the right to refused admission to anyone, and to remove any person, without assigning a reason if their behaviour is considered to be antisocial or likely to be disruptive. 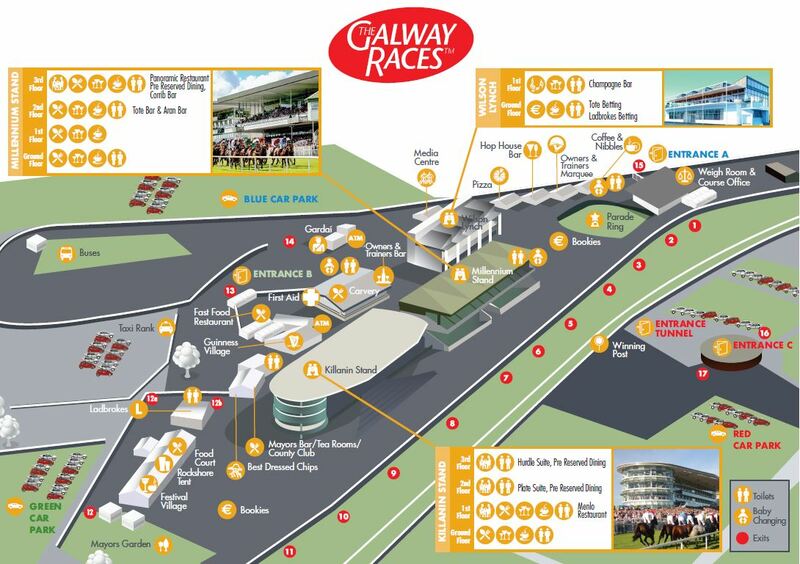 All persons entering the grounds are admitted subject to the Rules and Ground Regulations of the Galway Race Committee. Entry to the ground shall be deemed to constitute unqualified acceptance of the Rules & Regulations. Fireworks, smoke canisters, bottles, glasses, flags, banners, poles and other similar articles or containers including anything which could or might be used as a weapon are not permitted within the ground, and any person in possession of such an article or container may be refused entry or ejected from the ground. The climbing of pylons, stands or other buildings in the Racecourse is forbidden. Unnecessary noise such as that from the use of radio sets and behaviour likely to cause confusion or nuisance of any kind, including foul or abusive language is not permitted in any part of the ground. Under no circumstances is it permitted to throw any object onto the race track. Unauthorised persons are not permitted to enter upon the race track and may be ejected. Any person who fails to comply with the instructions from a Stewart may be ejected from the ground. The Galway Race Committee reserve the right for its servants or agents to remove from the ground any person who does not comply with the Ground Regulations or whose presence on the ground could reasonably be construed as constituting a source of danger, nuisance or annoyance to other spectators. Patrons are advised not to bring any unnecessary baggage onto the racecourse. Management reserves the right to have all baggage searched by Gardaí. Persons are prohibited from the selling of racecourse tickets on the grounds. 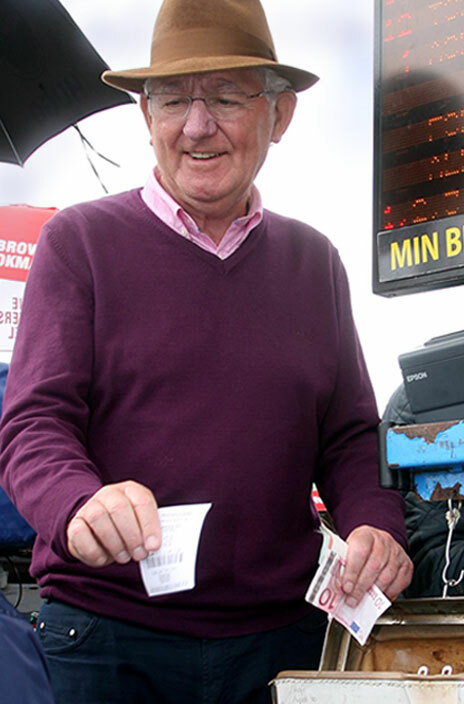 Bucket collections or other forms of fundraising are strictly forbidden on the grounds unless permission has been authorised by the Manager of Galway Racecourse. We have a strict ID policy on site and the following are accepted as ID for the bars and cigarettes. Please note that ID is required at all bars at Galway Racecourse. It is required by law that anyone between the ages of 18-21 are required to carry ID. Any ID that has been doctored in any way will be confiscated and given to the Gardaí. We are always pleased to hear from our customers and are grateful for any feedback you can provide about your visit. Please email us your comments to information@galwayraces.com as we value your interest in our racecourse and experience.